There are a lot of reasons why the A-Series engine is a nightmare to run on fuel injection – all of them linked to the five port head. With cylinders 1 and 2 sharing one inlet port and 3 and 4 sharing the other inlet port you get a problem related to the firing order. Basically one port draws in the fuel/air mixture followed immediately by the other paired cylinder. 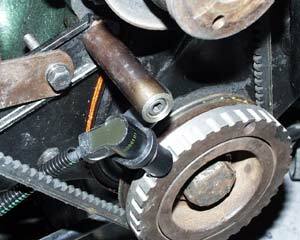 This charge robbing is not such a problem with the engine fed from an SU carb’. The air/fuel mixture is mostly prepared before it enters the port and each cylinder draws from this. Due to the cylinders 1 & 2 and 3 & 4 being paired along with a conventional firing order of 1-3-4-2 there is an uneven period between the intake strokes of the paired cylinders. In fact cylinder 2 will start drawing in air before cylinder 1 has finished its intake stroke (this is where the charge robbing effect comes into play). Whilst the charge robbing does have an affect fuel distribution with SU carbs it creates much more of a headache for fuel injection. Even with a fully sequential system it is normal for the injector opening time to overlap the inlet valve opening time at higher rpm and load’s. This is going to cause a problem with the A-series engine because some of the fuel destined for one cylinder will end up in the next cylinder. The end result on a fuel injected A-series is two cylinders than run lean (cylinders 1 and 4) and two that run rich (cylinders 2 and 3). Clever injector pulse timing and relatively large fuel injectors will allow you to get a measured quantity of fuel into each cylinder (as shown with Rover’s own fuel injected A-series system). The next problem is that as the engine is tuned and bigger cams are used the injection window actually becomes smaller and the injector size has to increase – so much so that high powered aspirated engine with twin-port injection it not really practical. 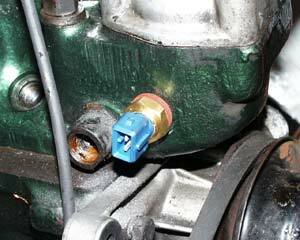 A single port injection set up is much like an electronic SU, sometimes referred to as running a wet manifold. Here the SU is replaced with a single butterfly throttle body. The fuel is injected just after the butterfly so that the mixture can be prepared before being drawn into the ports. This solution is a compromise - it allows you to control the fuelling more precisely than an SU without the complication and limitation of a sequential twin-port arrangement. As with the SU carb the distribution may not be perfect. So there are three possible answers to fuelling the A-Series engine. Answer number one will be discounted here – that’s fit an SU carb! 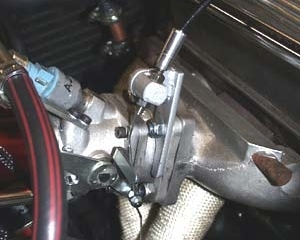 Answer number two is to have a sequential injection system which keeps the injector trigger points apart from each other. This is the Rover system outlined above. The problem with this system is that the time frame available for injection is very short on the robbed cylinder, making it really unsuitable for bigger power engines. If you are making a lot of power then you need very big flowing injectors to fit all the fuel in within the limited available time frame. 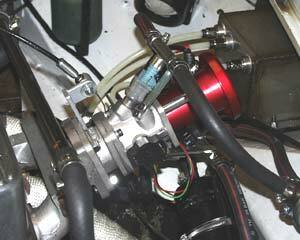 The easiest option is to run the inlet manifold as a “wet” system as with the carb. The injectors trigger way back up the inlet manifold and the engine doesn't know that you do not have a big SU carb bolted to the manifold. The difference from the SU set up is that you have full control of the fuelling at any given rpm and load site. On the 1275cc engine shown in this project we started out with a rebuilt engine on a soft MG cam - making 75 bhp on the original twin 1.25 inch SU carbs. 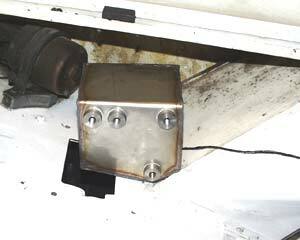 The mapped ignition we had previously fitted made the car very flexible and the fuel consumption improved considerably compared to the advance weight control in the distributor. 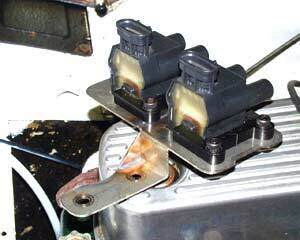 One of the first problems with fitting injection to a carburettor car is the fuel supply system. 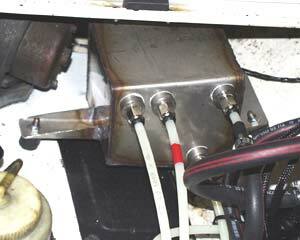 An injection system has no float chamber to act as a fuel reservoir during cornering. If you get fuel surge in a corner the engine cuts, or starts to cough, straight away. 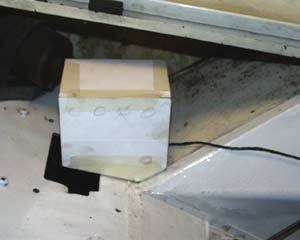 Rather than remove the fuel tank and baffle the pick-up, it is easier to fit a swirl tank under the bonnet. This is fed from the normal carb pump and the injection just circulates from the swirl tank to the fuel rail and back again. By having a small tank under the bonnet you regain your fuel reservoir and keep the high pressure fuel pipe runs to a minimum. 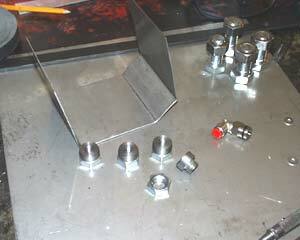 The tank in the pictures was welded up from stainless steel and mounted on rubber doughnuts. 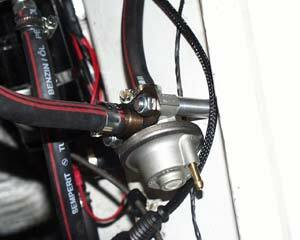 The fuel lines are clipped and crimped in place with turned up adapters where necessary. 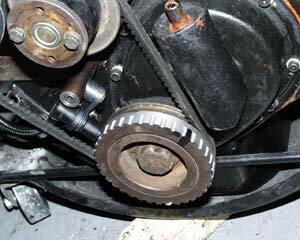 We decided to go the whole hog on this engine and fit a crank trigger for dizzy-less operation. 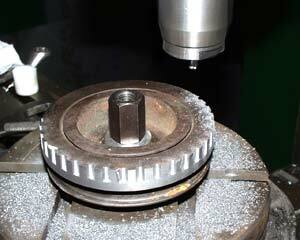 Rather than make up a wheel we machined the front damper with slots on the milling machine. Before you do this you MUST make up your sensor bracket and position the sensor. 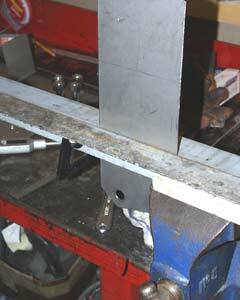 Then you cut the slots so that gap lines up with the sensor when the engine is approx. 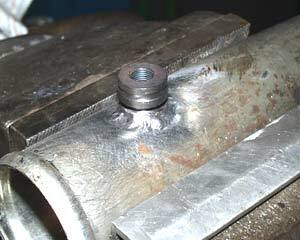 90 degrees BTDC (for a 36-1 pattern wheel). This 90 degree position is adjustable in the ECU’s software but it makes life easier to be somewhere near the default settings to start with. The reference is the woodruff key in the pulley, it sits dead vertical at TDC. The LCB exhaust was drilled and two bosses fitted so we could install a lambda sensor in an outer cylinder as well as the centre pair of cylinders. Monitoring the two sensors would show us how the injection distribution was being affected by the charge robbing. The distributor was retained with a single toothed Lumenition optical trigger that could now work as a cam phase sensor should we wish to look at running the engine sequentially in the future. After checking the plumbing for leaks the car was fired up for the first time on the new injection system. The ECU was the normal M3Dk unit, but with each injector on a separate injector channel that fire out of phase from one another. The result is injections events that occur twice as often and alternating between the two injectors. Cold start is monitored against engine water temperature and for this we had drilled a second hole in the head under the thermostat housing. You need to be reading engine temperature straight into the ECU, not radiator temperature. On the rolling road we were concerned that the injectors we had used might not be large enough in terms of peak flow rate. According to the calculator we had enough fuel for just under 90 bhp but that was extending the duration to almost 100 per cent. Ideally you need to keep the maximum injector duration to 80 per cent. There was no sign of charge robbing at all and the engine mapping worked out fine. 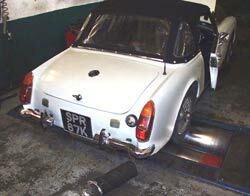 We had lifted peak power from 75 bhp to 90bhp. That’s a power gain of just over 20 per cent against the twin SU carbs. On the road we now came up against a bit of a problem. The stock suspension was being stretched to cope with the new increase in torque and we need to do something about it. There was also an oil leak from the engine, in spite of having taken the engine out to cure the leaks! The owner of the car reports much improved fuel consumption and a noticeable improvement in drive-ability as well as outright performance.